A car is like a bubble that seals us off from the direct experiencing of things. Suburbanites enter their garage without even stepping outside, get into the waiting automobile, and, thus ensconced, head off for their destination. In between—radio listening, phone calling, traffic signal following, and, possibly, a passing notice of what is around them. The memory of this trip came back to me recently since we are living in a French village without a car. That means for most of our travel, some form of public transportation is a requirement. One recent trip had us taking busses, trains, planes and, to finish things off, a cab. The final, taxi leg, provided a repetition of the car bubble experience. Airports, because they are usually quite a distance from the center of cities, tend to be another buffered zone. Bus and train stations, however, represent a whole other story. Sitting in the waiting room of the Marseille train station, it became obvious that the person seated back to back with us was the kind of individual we would never come close to in our automobile. The spectator in the car bubble is isolated from particular kinds of sights, sounds, and, yes, smells. Impossible here not to realize in a direct sense the plight of fellow humans. Before this person began to speak (in a loud, slurred, voice) his presence was signaled by the very obvious fact that he had not bathed in quite a while. The voice and subsequent additional odor (of cigarette smoke) gave evidence of someone in the grip of alcohol and tobacco addiction. When the security agent came over with a stern reminder that smoking was forbidden, another, sadly typical, fact became obvious: he was a member of the Arab subclass that makes up much of the bottom rung in French society. The waiting room, a fairly warm place, (nowhere in a French train station is “toasty” by U.S. standards) provides a bit of free shelter. Not that it’s easy to get to. Marseille’s St. Charles Station sits atop a knoll overlooking the lower city. It is best approached by a famous, long, staircase. There are 103 steps to climb before reaching the top. Hard to get to or not, the destination is sought after, if your only alternative is walking the even colder streets. The next leg on our journey involved a bus ride between Avignon and Carpentras. The Avignon bus station has open doors at either end. This means it is always cold in there. It’s kind of dingy, even more so than public transport places in French cities. Once again, what passengers cannot fail to notice, is how many of their fellow human beings find such a location to be the closest thing to a home. 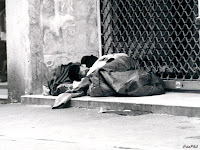 As we left the station, the final sight was that of a shabby bedroll occupied by someone catching some sleep, on the sidewalk just by bus exit. Non-car travel brings with it sounds (parole officer talk), smells (bath-deprived neighbor) and sights (makeshift outdoor bed) not ordinarily experienced. It also breaks the bubble and creates discomfort, which is not always a bad thing.